1 hour dog sled ride - ride in sled only: starting at $100. Experience the sights and sounds of the trails, without the responsibility. 1.5 hour short fun run with dog mushing school - mush your own team: $150. You’ll feel like a true musher after this trip. 3 hour fun run with dog mushing school - mush your own team: $250. We have a plethora of options for you if you book this tour. We can stay out longer on the trails, climb some hills, or start heading towards a warming break for lunch at iconic Ivory Jacks restaurant. 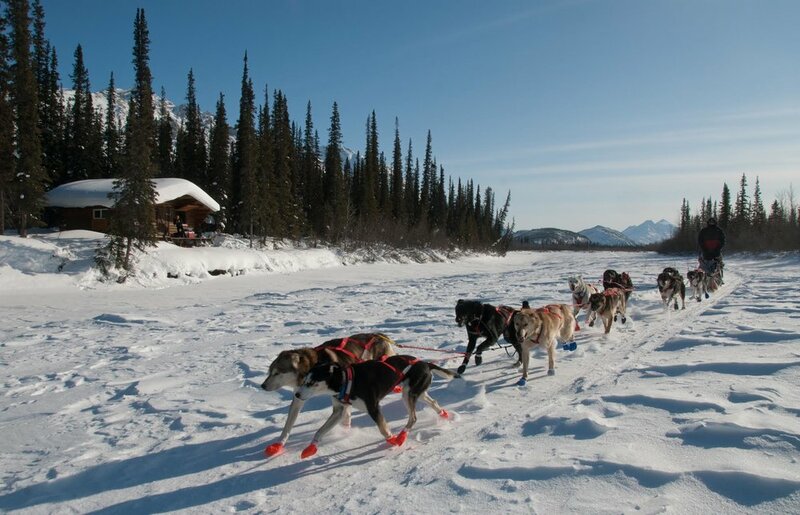 This is our most popular tour for people who want the real dog mushing in Alaska experience in a day tour. You may even desire getting your own dog team after this much fun! 2 hour aurora run - mush your own team: starting at $250. We will mush out at night to a secluded spot with a great open view of the sky to see the northern lights. Take in the magic of the aurora and enjoy the howl of the dogs at the aurora and the moon while you warm by a campfire. Overnight(s) tours are really the way to experience Alaska. You get to spend more time with the dogs and out on the trails. You also have the best possible chance to view the northern lights. We can make you comfortable no matter the wind or the weather. All overnight tours are a custom package and rate. The prices listed are a starting point as the rate changes depending on options you would like. Please contact us to get a quote for your overnight(s) tour. Stay in furnished cabin on Friendly Arctic Adventures property. This 16x20 log cabin with loft is fully furnished and set up for a couple. Larger groups can request additional bedding be placed in the cabin. This package overnight stay includes a day mushing tour on the trails for each night stayed and a night tour (if desired) to see the northern lights. Two person minimum is preferred, prices start at $550 per person per night. Stay in remote cabin in the White Mountains National Recreation area. These cabins are rustic in nature but a very welcomed sight after a day on the trails. The Bureau of Land Management operates this land and has restrictions on the use of these cabins to commercial operators like myself. If you would like this option, we will not be able to stay out there on weekends (Friday & Saturday nights), or holidays (Thanksgiving, Christmas & spring break). Two person minimum is preferred, prices starting at $ 995 per person per day. Stay in heated Arctic Oven tent out on the trails in the Goldstream Valley. For many people a day tour is just not enough. Camping on the trail as we mushers do when we are out on our own is an experience to behold. We will spend the day out mushing on the trails and arrive to our tent just as the sun is setting. If you want to know how we live and travel, this is the overnight tour for you. Two person minimum is preferred, prices starting at $1,350 per person per day. April Brooks Range Tours & Expeditions. For the month of April we operate a mushing camp just on the north side of the Brooks Range mountains. From our base camp at the edge of the mountains we offer 3 & 5 day tours for day mushing and aurora viewing. We also offer longer multi-day expeditions that could take you from our camp to remote river valleys and canyons, or even to a remote village nestled into the mountains. Out here, our imagination is the limit. Prices start at $1,200 per person per day, groups of four preferred.